The ICC T20 preview kicks off in Sri Lanka this week and anyone could win it this year. In a tournament more open than the legs of your average Jeremy Kyle teenage girl guest, The Middle Stump predicts the winners about as well as these characters predict who the father will be of the their forthcoming child! Like these girls on a Sunday morning, I don't predict anyone, or the trophy, going down under, it will no doubt be won by a side from the subcontinent, but here we look at who has a chance of winning the tournament. England have one of their youngest sides for years, with only Swann and Lumb over the age of 27 (the average IQ of the audience of the afore mentioned Jeremy Kyle), and the current holders must be in with a chance of retaining their trophy. A lot will depend on the likes of Morgan without Pietersen around and the ability of the English batting to be able to play spin, and hopefully the English middle order will not be as overly exposed as recent pictures of their Duchess of Cambridge, Kate Middleton. Graeme Swann is also crucial to England's chances. India with Gautham Gambhir will be a handful and rightly so with their youngsters coming through, brought up on a diet of Indian Premier League T20. Duncan Fletcher has turned them into a better fielding side and Harbajhan, Dhoni and Co. will be there or thereabouts come the end of the tournament. Ravi Ashwin will be key for India with the ball, whilst Irfan Pathan is a dangerous customer with bat or ball in his hand. Afghanistan are not the mugs everyone thinks they will be, and another side who the conditions will suit. Their bowling is decent and could well give England a run for their money in Colombo on September 21st. Skipper Nawroz Mangol and his off breaks will be the key to decide if they progress. Australia are one of the worst sides in the world at this form of cricket which is surprising, but Mr Cricket, Mike Hussey will no doubt lead the batting line up and they are capable of springing a surprise. Watch out for the brilliant fielding of Steve Smith, which is far more prettier to watch than his face! George Bailey is one of the rising stars of Australian cricket, and their Big Bash League. Write them off at your peril. West Indies are an outside tip to win this tournament and with Chris Gayle in their ranks, are capable of chasing down any sort of total. Sunil Narine will be hoping to enjoy the turning tracks, and he was one of the stars of this years IPL. Look out also for Johnson Charles, only the second St Lucian after Darren Sammy to play for the Windies and this keeper/batsman gives it some serious licks, as they say in that part of the world. Ireland are capable of causing a shock and with the O'Briens, Dockrell and Murtagh in their ranks have the ability to win games of cricket. Great team spirit and good fielding abound, and they have a chance of qualifying out of this group. Paul Stirling gives it a whack, and is one of the main men for Middlesex in this format. Sri Lanka are the hosts and in eighteen year old Akila Dananjaya, the new Murali, they have one of the potential stars of the tournament. Must be in with a shout on home tracks. Shame they are not playing in Galle this year, which is one of the prettiest grounds in the world with the ocean there, and the fort in the background. SL will be used to the heat as well, which can get up into the 40's in this part of the world. Expect the left arm spin of Herath to do well, and the brilliant Kumar Sangakkara and Mahela Jayawardene to finish off their careers in style. South Africa with Hashim Amla fresh from a fine tour of England in great form, Dale Steyn and Morkel, are the number one side in the world at present, but will their spin bowling let them down? Only time will tell. They should easily qualify from the group, but may struggle on the subcontinental pitches against the better sides. De Villiers may struggle to keep and bat, his average certainly suggests so. If you bet on Zimbabwe you have absolutely no chance of seeing your money back. You have more chance if you respond to one of those Nigerian hoax e mails asking for your bank account details. 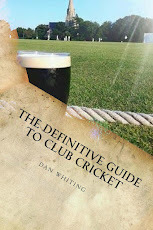 Feel free to give it to the boys at The Middle Stump, or even better, give it to a worthy charity such as Factor 50. They do however, have the fantastically named Graeme Creamer in their side! Pakistan are my tip to win this tournament. Saeed Ajmal will be one of the stars of the tournament and should the real Pakistan turn up I think they will win it. The only fly in the ointment is whether the real Pakistan will turn up? Kamran Akmal will no doubt be getting under more peoples skin, than the local mosquito population, but if the goofy keeper is less Mickey Mouse, he can cause more damage than a pisshead in a town centre on a Friday night! New Zealand with Brendan McCullum and Daniel Vettori have to be in with a shout, and they have played recently in Asia which will help the Black Caps. Tim Southee is becoming very impressive in all formats of the game, and will be looking to put himself into the shop window of the IPL auction. A tough group to qualify from though. Bangladesh aren't as bad in this form of cricket as they are in the Tests, but I expect Pakistan and New Zealand to have too much for them in this group. Turning pitches will favour them however. Abdur Razzaq (not that one!) and Shakib Al Hassan with the ball are match winners, and the dangerous Tamim Iqbal with the bat is someone to be removed early doors. So there you go, two sides from every group will qualify and go into the Super Eights which will consist of two groups. England, should they qualify will go in as A1 as they are seeded no matter where they finish in the top two, and will be based in Pallekele. The other group will be based in Colombo, and the top two from each of these will go into the semi finals, which is then a straight knock out. It will be very interesting to see who wins this event in the final in Colombo. Come October 7th, we will all know. England have a great chance to retain the title particularly if their batting comes off. India and Sri Lanka have great chances too, with the comp being in the sub-continent. Afraid I'm not a Saeed Ajmal fan he has a suspect action in other words he chucks it. Sorry if I'm upsetting Pakistan fans it needs investigating, Murali went through it, so should he. Anyway enough ranting, England and India are my tips for the final. Really love the Zimbabwe comment too. Do hope Afghanistan and Ireland show that they are not there making up the number. Neil@ReedCC. These comments are Neil's own personal ones and do not in anyway reflect the views of Reed CC as awhole. England have to learn from their poor performance against India, firstly not to slog across the line against world class spinners. Finally not to try to end the game in 11 Overs, Andy Flower and Stuart Broad be warned. Neil@ReedCC. I've just watched the Super Over between Sri Lanka and New Zealand. The wides NOT given by the umpire in Malinga's over were disgusting. Do the laws on wides not apply in the Super Over? Neil @ ReedCC. Disappointing end for England in the World T20. Some dubious selection in that last game and a certain Mr Malinga also. Still the ladies are still flying the flag. Neil@ReedCC. Hi Neil, yes it was a bit disappointing wasn't it, if not unexpected? Oh well, now let us watch our batting struggle in the tests in India! What's your steer on the never ending Pietersen saga. I feel that he shouldn't be allowed back, if anyone did what he has done in business they would have had their P45 immediately. Hope Liam is okay. Cheers Neil@ReedCC. Cheers Liam good to hear from you, must meet up in Welwyn Garden City when you're free. Neil@ReedCC. Suprisingly The I agreed with me on the five main reasons for England's T20 World Cup failure but in a different order.I'll give my order below with I's in brackets, be interested on what others think. Neil@ReedCC. 5. The Pietersen affair (2).